A quick post for an easy but interesting side dish I just made. It's the type of thing I get excited about - simple, but not boring. All in one pan. I stumbled on this recipe for Coconut-laced Spiced Spinach as I was flipping through Anjum Anand's new book. Not much more than ten minutes later, we were sitting down to the table with it as part of our meal. You toast a few spices, add a pile of shredded spinach to the skillet, and finish things off with a burst of lemon juice and some shredded coconut. I went off-road with the recipe a bit and added chopped asparagus - because we have a lot of it right now. And because I love it. And because, why not? The cumin is really nice here. Don't skimp. I might even add a pinch more next time around. And if you like more heat, add more red pepper flakes to taste. 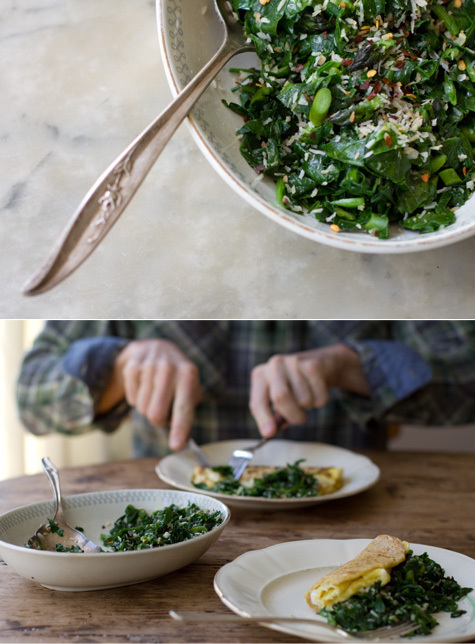 Also - I know some of you are sick of hearing me say this - resist the urge to overcook the spinach. You want to cook it just long enough for it to collapse, cook through, and brighten up. And keep in mind it continues to cook after you pull it from the heat. I think I'm so excited about this in part because it is so versatile. While it makes a great side - I ended up having it on top of one of my "special" quesadillas. I can also imagine it on an open-faced veggie burger, in a taco, in a wrap, over brown rice or farro, etc. Or make a meal of it with some grilled tofu, paneer, or fried egg. Let me know if you end up making it, and what you do with it. Hope you like it as much as I do. And thank you Anjum for the inspiration - I'm really enjoying the Ayurvedic angle of this book. As I mention up above, this spinach makes a great side. I can also imagine it on an open-faced veggie burger, in a taco, in a wrap, etc. Or make a meal of it with some grilled tofu, paneer, or fried egg. You can easily make this vegan by using oil instead of ghee/butter. Place the shallot and garlic on a cutting board, sprinkle with the salt, and chop/mash everything into a paste. Heat the oil in your largest skillet over medium heat. Add the seeds, cover with a lid, and let them toast a bit. Remove the lid, stir in the red pepper flakes and let cook for a minute. Stir in the asparagus if you're using it, let cook roughly another minute, then stir in the garlic-shallot paste and all of the spinach. Keep stirring until the spinach starts collapsing a bit, and brightens up - barely any time at all - perhaps a minute. Finish with a bit of fresh lemon juice and the coconut. Inspired and adapted from the Coconut-laced Spiced Spinach recipe in Anjum Anand's Eat Right for your Body Type: The Super-Healthy Detox Diet Inspired by Ayurveda.